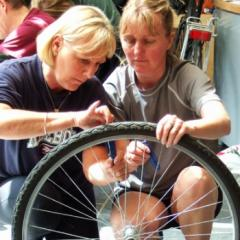 Popular bike maintenance courses come to Wales! Cycle Training Wales are launching a range of bicycle maintenance courses in Wales starting next month. The courses vary according to ability and budget but all are all Weldtech courses, externally certified by Velotech Cycling. Beginner – A full day course for home mechanics and those wishing to learn about basic bike repair. 20th August or 17th September. Weldtech Gold - Recognised by the Bicycle Association of Great Britain, the Weldtech Gold qualification is aimed at professional mechanics but is of interest to anyone seeking an in-depth knowledge of bike maintenance. Confirmed dates are September 19th - 22nd and October 17th - 20th. All courses will be held at Cardiff Cycle Workshop. Full information can be found here at www.cycletrainingwales.org.uk or by contacting Nick Canham on nick@cycletrainingwales.org.uk.